Uncompromising. Avant-garde. Determined. Visionary. Inspired. This is the Oakley Jawbreaker, their latest innovative sports performance sunglass. Featuring their tried & tested Switchlock lens change system, this design leads the way to the top of the mountain and back through the sprint finish. Snapback Collection. Sapphire Blue with Prizm Jade Lens. Polished White with Prizm Road Lens. Matte Clear with Prizm Ruby Lens. Matte Clear with Prizm Sapphire Lens. Matte Clear with Prizm Black Lens. Matte Clear with Fire Iridium Lens. Aero Flight Collection. Matte Carbon with Prizm Ruby Lens. Prizm Road Collection. Green Fade with Prizm Road Lens. Prizm Road Collection. Matte Black with Prizm Road Lens. Polished White with Prizm Snow Sapphire Iridium Lens. Photochromic. Polished Black with Clear Black Iridium Photocromatic Lens. 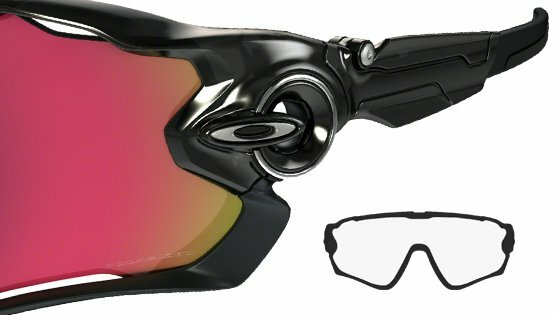 This is Jawbreaker - another sports performance piece launched by the leading optical sports brand in the world - Oakley. It took them 2 years to perfect, with 100 design iterations, had over 9,600 hours of lab testing and was created in collaboration with multi Grand Tour stage winning road cyclist - Mark Cavendish. Designed to improve the upward field of vision, it gives the wearer unbelievable visionary precision. Ventilation ports above & below the lens seriously reduce the risk of fogging and the Switchlock technology enables you to swiftly release the lens and lock in a new one. Some may call it Gung-ho, we called it simply brilliant.